Throw on some good tunes before you do anything. Preheat convection oven to 375 degrees with three racks ready to go (you’ll be using the middle rack , the rack right above the bottom, and the rack right below the top). Line the baking sheets with some parchment paper – or just throw the dough on the sheets, it’s up to you. In your electric mixer bowl cream the butter. Then add the white and brown sugars and beat them like they owe you money, or for about two or so minutes. Once fluffed, beat in the eggs one at a time – Wait about a minute before tossing in the second egg. Make sure to grab a rubber spatchula and mix in all the love from the sides of the bowl the mixer attachment missed. Add the vanilla and beat once again for about a minute. In a separate bowl, combine the flour, baking soda, and salt with a utility whisk. Whisk it up for about thirty seconds. Yeah. Turn the electric mixer on (with the butter, sugar, egg mix still in the bowl) and slowly add the flour combo you just whisked. Right before you add the last portion of flour mix, rip open the bag o chocolate chips and pour them into the bowl, followed by the remainder of the flour mix. After about thirty seconds turn off the machine, lift up the mixer arm, grab the spatchula and make sure it’s all mixed up real good. Grab a 1/4 cup measuring cup, and scoop up your first cookie. Level off the dough, swing on over to your cookie sheets, stick your finger in the 1/4 cup full of dough and plop your first raw cookie on your cookie sheet. Repeat twenty three times. Eight cookies per sheet. Stick them in the oven and wait for the love. 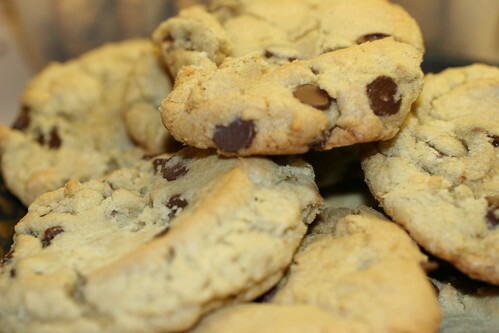 We live at about 3600ft above sea level and dig our convection oven, which produces killer cookies. So in our case we leave the cookies in the oven for about 15 minutes, resulting in the top and bottom racks producing nice, lightly browned and crispy cookies, while the middle rack produces chewier cookies. Using all three racks makes for cookies that are both crispy and chewy for all to enjoy. Once they’re done, lay them down on a wire rack – spray them with a little (super little) water to keep them chewy longer. Put them in a jar or container (glass or ceramic is best) after they’re cool. Actually wait – it’s best to eat maybe one and give the rest away immediately, or else you will eat them all and then your kids will yell at you. I found the worst time to make these is when you’re really hunger. Happiness is a warm cookie.